Everyone knows Tom Hanks is the nicest guy in the Hollywood, but just in case you needed further proof, open wide, because we’ve got another delicious Tom Hanks story for you. Earlier this week, the 62-year-old actor was on a weekend trip in Fontana, California, with his family. Naturally, they got hungry, so stopped off at one of the finest establishments on the west coast – In-N-Out Burger. An Oscar-winner’s got to eat, right? 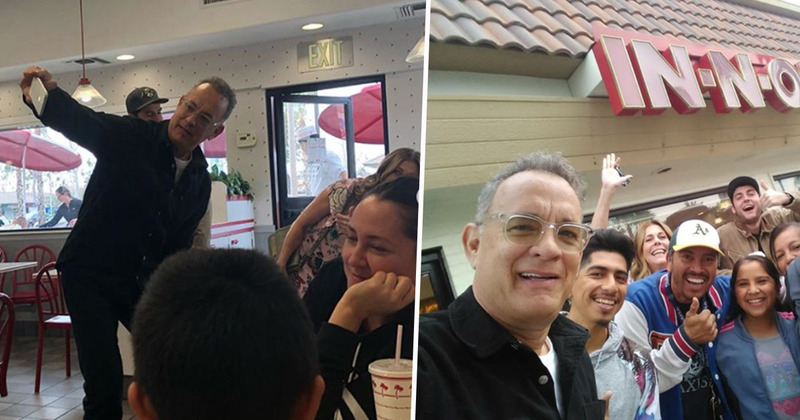 But because this is Tom Hanks, and because Tom Hanks is Tom Hanks aka the nicest person in Hollywood (and probably the nicest person in many other places, too) the actor decided to pay for everyone’s lunch, talk to a number of fans who spotted him in the restaurant and take a few selfies, too. Tom was with his wife, Rita Wilson, who also chatted with starstruck fans and stopped to take pictures with them. On his way out, the actor even went round to the drive-through window and paid for lunch for all the cars that were queuing up at the time. What a thoroughly nice chap. Look who visited Fontana In N Out! Woody himself, Tom Hanks, and he bought lunch for everyone! Nice! I had the absolute honor of meeting the one and only Tom Hanks and his beautiful wife Rita Wilson today! The coolest people I’ve ever met! Tom Hanks is at In and Out sitting across from us I’m star struck!! He is such a nice guy taking pictures with everyone….he told us Merry Christmas… And I went over and talked to his wife Rita while Tom took pictures with everyone! Tom signed In-N-Out hats and took pictures with everyone. He was genuinely nice, laughing, talking with everyone and taking selfies! He wished us a Merry Christmas on his way out. Of course he did, he’s the nicest man in Hollywood! Perhaps Tom is preparing us all for the emotional onslaught that is Toy Story 4, which was apparently so emotional to make that the actor struggled to get through recording it. It was the first time that we were going to be recording the end of the movie, and Toy Story  is going to have an impactful ending. While co-star Tim Allen also revealed he ‘couldn’t get through the last scene’. Ah Tom, you’ve done it again! You can catch Toy Story 4 in cinemas as of June 21, 2019.